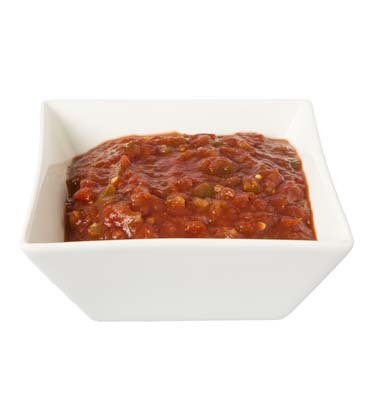 This chunky salsa is a delicious mix of sweet and spicy. banana, medium, peeled, sliced	 17 ea. 2. Toss bananas with cumin, coriander and brown sugar.Place on a lined sheet pan and cook about 10-15 minutes. onion, small, diced	 2 ea. 3. Heat olive oil in a saucepan over medium-high heat. Add onions and sauté. 4. Add corn and roasted garlic and continue to cook for 5 minutes, stirring continuously. roasted red bell pepper, diced	 9 ea. 5. Add the diced peppers and Pace Chunky Salsa,continue to cook for 5 more minutes. 6. Mix in the bananas and serve hot or cold. roasted red bell pepper	 9 ea. Add some heat with diced or serrano peppers. Fire roast the corn on a grill for a deeper smoky flavor profile. Delicious on top of pork al pastor tacos. A delicious topping for chicken and pork. Great served hot as a garnish, or serve with tortilla chips for an easy appetizer.